The reflections of pedestrians are seen in a window of the International Business Machines Corp. (IBM) Watson headquarters in New York, U.S., on Tuesday, Oct. 7, 2014. 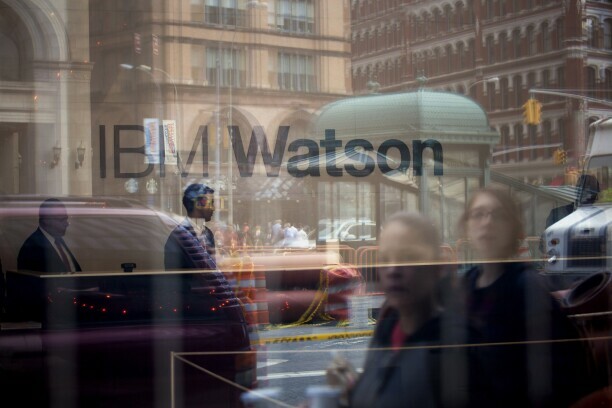 The makers of IBM’s Watson artificial intelligence tool have been in quiet, informal discussions with a small group of prominent law firms in a bid to launch an expansion of offerings for firms and to help them collaborate around AI. IBM until now has been mostly content to focus its legal business marketing of Watson—arguably the world’s best-known AI system—to legal departments within large corporations, Brian Kuhn, co-founder and global leader of the Watson legal practice at IBM, said in a Jan. 30 interview with Bloomberg Law. Though IBM has a select number of arrangements with U.S. and U.K.-based law firms already in place—which Kuhn, citing non-disclosure agreements, declined to detail—the company is preparing for a larger-scale entrance into the American and British law firm markets. Kuhn said IBM Watson Legal, the legal services branch of Watson, will make an announcement on the matter sometime in 2019. Several of Watson Legal’s clients to date have been in insurance industry legal departments, said Kuhn. Watson’s tools can speedily read and understand legal invoices from outside counsel, thus helping departments reduce legal spending. Though he declined to provide many specifics, Kuhn said the group has been talking about the possibility of building a series of AI tools to help to mine and decipher valuable, existing data that firms already possess, including pleadings, as well as emails, interrogatives, memos, and case research from previous client interactions. He called this data the “actual unstructured documents” created by the firm. Key questions Kuhn said the group is discussing include how to repurpose firm data and mine it for insights. Kuhn declined to name the firms involved in the discussions, or say how long they had been ongoing. He did say that the number is on the smaller side, closer to three firms than 20. He said “it’s incredibly cool” that the firms have come together, despite the usual competitive pressures, to help devise novel AI solutions. Kuhn’s confirmation of discussions with major law firms comes as firms have been attempting to speed their adoption of AI tools to satisfy increasingly restless clients, who are demanding that their outside counsel develop legal business solutions that are cheaper and faster, and provide better results. And firms, historically slow tech adopters, are lagging behind their clients on that score, said Kuhn, who is an attorney himself. Forty-eight percent of corporate legal spend is in-house, Kuhn said during his keynote address—and that percentage has been growing by one to two percent in each of the last several years.